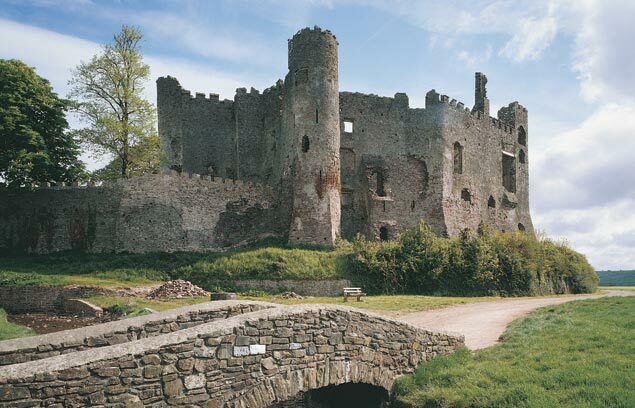 Laugharne Castle (‘Castell Talacharn’) is a castle in the town of Laugharne in southern Carmarthenshire, Wales. It is located on the estuary of the River Tâf. The original castle was established by 1116 as the castle of Robert Courtemain, who is recorded to have entrusted its care to the Welshman Bleddyn ap Cedifor. The castle also was the meeting place of Henry II of England with Rhys ap Gruffudd in 1171-1172, where they agreed a treaty of peace. When Henry II of England died in 1189 the castle along with St Clears and llansteffan were seized by Rhys ap Gruffudd of Deheubarth in 1189. Laugharne Castle may have been burnt down at this time. The castle was rebuilt by the Normans and in 1215 was captured by Llywelyn the Great in his campaign across South Wales. By 1247 Laugharne was granted to the de Brian family. In 1257 Guy De Brian was captured at Laugharne Castle by Llywelyn ap Gruffudd and the castle destroyed. In 1584, Elizabeth I granted Laugharne to Sir John Parrott, said to have been the illegitimate son of Henry VIII. During the Civil War, Laugharne was captured by Royalists in 1644, the Parliamentary forces of Major-General Rowland Laugharne attacked the castle in 1644. After a weeklong siege in which much of the castle was damaged by cannon fire, the Royalist garrison finally surrendered. The castle was slighted to prevent any further use. It was left as a romantic ruin during the 18th century, and around the start of the 19th century the outer ward was laid with formal gardens. The gazebo overlooking the estuary was used in the 1930s and 40s by the author Richard Hughes, who leased Castle House during this period. Laugharne has also inspired two great modern writers, who worked in the garden gazebo overlooking the river. Richard Hughes wrote his novel In Hazard here, and Dylan Thomas, Laugharne’s most famous resident, worked in the castle on his Portrait of the Artist as a Young Dog.